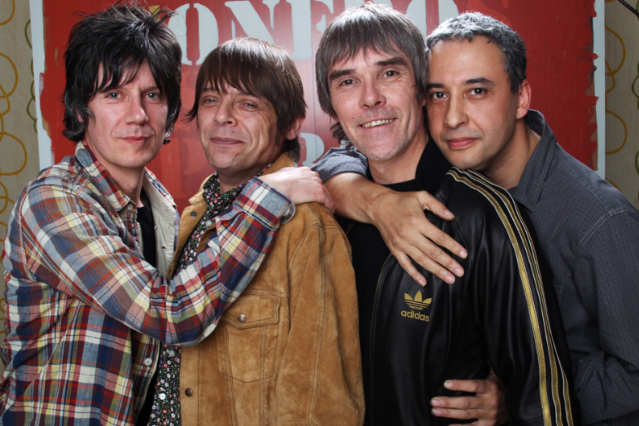 The Stone Roses are alive and well. Several months after confirming plans to reunite for their first concerts in 16 years, the Manchester, U.K.-based band played a last-minute show last night at Parr Hall in Warrington, England. Announced only a few hours ahead of time, the concert was free to anyone who came with a piece of band memorabilia or a ticket to one of the Stone Roses’ scheduled gigs this summer, according to Consequence of Sound. Singer Ian Brown, guitarist John Squire, bassist Gary “Mani” Mounfield, and drummer Alan “Reni” Wren played 11 songs before a crowd of just 1,500, according to the NME. The set reportedly included “I Wanna Be Adored,” a classic off the band’s 1989 self-titled debut, and “Love Spreads,” from 1994’s The Second Come. There was no encore, which isn’t unusual for the Stone Roses, but they didn’t play “I Am the Resurrection,” their typical finale. Although not much footage has emerged from the show just yet, you can watch decent-quality snippets of “I Wanna Be Adored” and fellow debut-album single “Waterfall” below — plus a clip of the Stone Roses powering through the chorus of The Second Coming’s “Made of Stone,” with its bouncy echoes of Primal Scream’s indie-pop ur-text “Velocity Girl.” Another video has surfaced that claims to contain audio of a “new song”; the NME says this is actually a reworking of early non-album single “Sally Cinnamon,” but the lyrics are different, and given the barely comprehensible recording quality we’ll have to wait for official word before saying for certain. Are the Stone Roses Over?